We came after a much busy and long awaited time away from the city of Charleston. We`ve been looking forward to relaxing since October 2012. This was "Peace of the Mountain" in more ways than just the literal one. the view, the thought in every details of the cain, the fireplace, the hot tub, the back porch....all put us at peace. We are so blessed to have been able to come and enjoy these things and will cherish these memories forever. We are thankful for allowing us into your beautiful home. 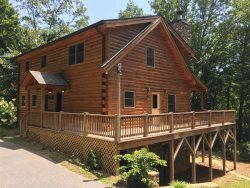 We look forward to coming back, stopping at the Filling Station, fishing at the torut pond, exploring Bryson City and watching the sun set over the mountains. One question; Can we move in? Loved it, just about perfection - peace & quiet, gorgeous views, seclusion & all the comforts of home. Thank you for sharing your cabin with us. A nice respite away from the toils of our busy lives. We loved this house! Awesome mountain views, very homey. Beautiful secluded spot. We cooked s`mores over the fire pit, used the hot tub, enjoyed this house very much. We went to Great Smoky Mountain National Park, climbed Clingman`s Dome, hiked, went fishing, horseback riding, white-water rafting on the Nantahala. (Endless River Adventures was awesome) Went tubing (JJ`s Tubes on Deep Creek is a must!) Loved our vacation! Thank you we hope to come back again. The Peace of the Mountain Cabin is amazing. I am totally in love with it!! Had never witnessed such an amazing view! Totally loved everything about it. Will go back to stay there on our next vacation to Cherokee. My family has been visiting the "Smokies" for over 40 years and we haven`t missed a year. Last year we discovered Paradise Valley Lodge and fell in love with its location. This year we decided to return with three generations of tubers. After all these years of Visiting North Carolina and staying monthly in our favorite places, Bryson City, we have experienced all of the places and explored many different areas, but we truly love the serenity and value the memories we have added while staying at P. Valley and look forward to returning again next year. Our Family Comes to Bryson City every year and I think that we have finally found the perfect place to stay. We had four generations of crazy generations of crazy folks here and stayed busy every minute of the week. We fished and tubed in the creek by the house. , tubed Deep Creek (the water was running great) Kayaked and fished (and unintentionally swam) Lake Fontana. We hiked what seems like all around the mountains and camped out one night (nothing better than the sound of the creek to lull you to sleep!) Lots of s`mores were eaten, lots of ghost stories were told. We highly recommend "Unto These Hills" in Cherokee. Thanks for an amazing place to stay for an amazing week. Love this place and location. Kids had a ball. Great family place and location. Wish we had planned a much longer trip here. There is so much to do within a 45 min radius. The town itself has been a joy; Shops, restaurants, train and museum were great especially the train ride. Really enjoyed the Nantahala Ruby mining. Found some wonderful rubies, citrines, sapphires and emeralds and 1 huge star sapphire - 4 year old Noah was obsessed with mining after that. Tubing here on the creek was great. Had a great dinner of grilled trout that Noah caught from the Cooper Creek Trout Farm. Wonderful meal @ the Cork and Bean. Highly recommend that place! Made a fire and roasted marshmallows, grilled burgers. Great time had by all. We will be back for a longer stay!!! We has a wonderful stay at Native Winds. My husband and I celebrated his 40th birthday. What a perfect place for such a memorable weekend getaway. We will defiantly return to this beautiful place. My wife and I had a great time at this cabin. It was my first time in North Carolina nit not my last. This cabin made the trip special and worth coming back. We will recommend this place. Thank you !! Thank you for sharing your wonderful cabin with us. From the moment we walked in until we said our said good bye, we couldn`t have asked for more. Well except maybe a little lest rain, something you should have total control over. It was great for relaxing after exploring the roads on our motorcycles. It was just the two of us and we had a great visit. The cabin fit us well and had eveything we needed. We drove out to Fontana Dam for prictures. Water on the reservoir is very low but still nice. Took a trip along the Nantahala and up to the lake. Very pretty. Looped around to Franlin and back. Cooked a couple of ribeyes on the grill and relaxed by the fire and in the hot tub. Very nice stay and plan to come back! Best thing for me was the military discount. We had a great time in this cabin, and we had a great trip! We did lots of amazing things. Like, we went whitewater rafting for the first time, and we even saw some wild elk!! We saw 2 females at first then after we went hiking, we came back and saw another female. Then we saw one male elk! We also got to relax in the hot tub after. We made s`mores in the microwave and they tasted great. The rafting was really fun too. We definitely got splashed a lot! And the pictures after were hilarious! And the forest we hiked in was really pretty. It had little streams and waterfalls and lots of trees. We also saw some really cool butterflies too. And we`re also going horseback riding tomorrow on our way back home. I had an awesome time, and I`m really glad we got to stay in this cabin. What a great time! The cabin was perfect and the view is amazing. We were here for a family reunion and had time to explore. We did white water rafting, horseback riding, and drove the Blue Ridge Parkway. There is so much to do and we can`t wait to come back. The Nantahala River is a blast even for beginners! Horseback riding across the street was great -- we took a 2 hour ride and it started pouring down rain and we were soaked. Blue Ridge Parkway was beautiful and easy drive. We had a wonderful time and hope to come back and stay in this cabin! We had an amazing time and it was an amazing cabin. We can`t wait to come back. We love this cabin, very luxurious and great location. The little black cat often comes to visit and loves to be stroked. Horse riding, whitewater rafting, zip lining and hiking are all great nearby activities. Let me just say that Janet and Josh are the best!! They went the extra mile to make us happy. The cabin was perfect for our needs and comfort and WE WILL BE BACK!! Thank you for a wonderful time and a job well done. We had a perfect vacation! We loved the outdoor fireplace and were able to roast marshmallows, even in the rain. We relaxed on the porch and in the hot tub. And during the day, there was plenty to do from hiking to boating. Great memories of a great time. Our family`s got a chance to spend time together with the wonderful mountain views and yes the many trips to Ingles (love the rewards card you left us) and for those breakfasts to give us energy for tubing down the ice cold tumbling streams, walking and hiking in the Smokes. The early risers caressed their coffee cups and sat in the silence of the mountain mornings until the birds began to appear. Children`s voices permeated the cabin with hopes of adventures and fun. We took the train ride on our rainy day and enjoyed the game box, fire pit, and all the extras. Love the fire flies, birds, and lady bugs and nature. The cabin is wonderful. The views are beautiful. We really enjoyed ourselves. The cabin was awesome!!! My family had a wonderful time. The cabin had everything as pictured. Very clean and comfortable. Close to Nantahala and Bryson City. Secluded but not too far away from town. The road is very windy going up. Look forward to next visit.